Satchels are back in a major way as we move into the spring of 2015. We know, we know – it almost seems counterintuitive; spring is a time of light, flouncy dresses, with the only structure in sight being the occasional blazer as a topper, reminding us of our days in primary school. But the satchels hitting the runways – from Prada, to Celine, to Balenciaga – were a big inspiration for us at PLIA Designs, which is why we created this little beauty for our always-on-trend clients: the Pixie Reid Alice St. Mini-Satchel. The Pixie mini-satchel is actually the epitome of all things spring – it is a tiny bud of hope for the near-future, when we all take our summer vacations and pack our favorite luggage chock-full of breezy, light styles and floppy straw hats. And yet, this little wonder can still hold all of your essentials: wallet, keys, lipstick – the whole shebang. It even holds your iPad mini, has two smartphone pockets, and leather credit card slots. It’s like a fashionably constructed cave of wonders. 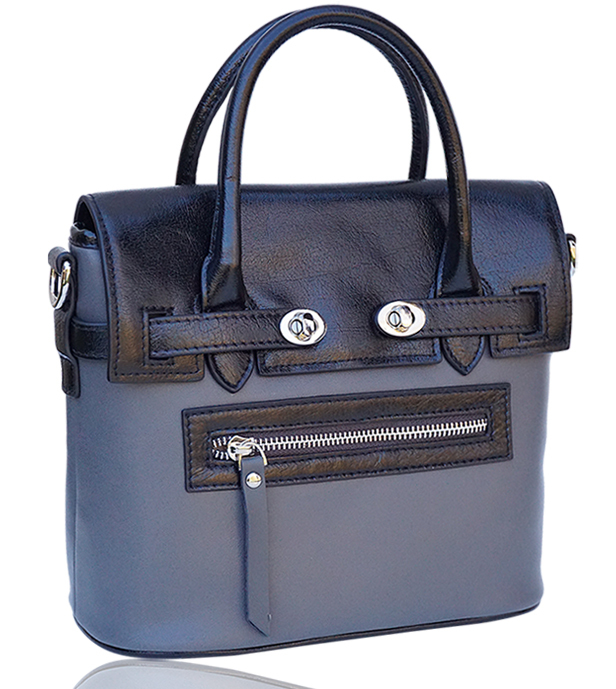 Since PLIA specializes in leather goods and hand stitching details, they have spared no expense in making the Pixie. It has a detachable “seatbelt” shoulder strap, so you can just sling it over your shoulder when you’re running out the door to work or on errands, and a dustbag to keep it in the most pristine condition. Special features include a gray leather body, black leather double-sided flap, handles, and trim with a linen weave fabric on the inside. The exterior exposed zipper detail recalls our days living la vida grunge in the 90s, but without going too far into the dreaded territory of, “Is she or isn’t she a teenager?” Think of it as grown-up revamp of your formative years – who among us wouldn’t want a do-over of our awkward phase? PLIA Designs has you covered with one its new designer handbags. Additionally, the Pixie mini has been showing up on the glamorous arms of celebrities: Whitney Port, Emma Stone, Lauren Conrad, and Alexa Chung have all been snapped carrying tiny versions of the style staple – and all have become (or are becoming) fashion icons in their own right. One of the best features of the Pixie is the color it comes in: neutral grey with black leather and silver hardware details. The color is perfect for the transition from winter to spring – it can go with your dark tights with cutout details or your bright pink new spring dress. Truly, it’s perfect for any season, because it goes with both brights and other neutrals. The color combination of black, grey, and silver is chic and understated, making it an essential accessory for your entire 2015. Take a page from the celebrities’ little black fashion books, or from the designer runways and pick up a Pixie Reid Alice St. Mini-Satchel today! For more details, head over to the Pixie product page, or contact customer service and let us know how we can answer any questions you may have.